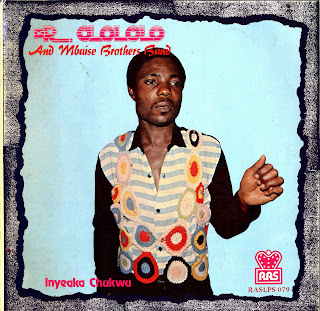 For the next selection on the highlife turntable, I have chosen the song Anyi Ayohuola by Dr. Olololo and his Mbaise Brothers band, off a RAS release Inyeaka Chukwu. I do not know much about the band. I believe they are from the Anambra state. I have one other record which lists the band as Olololo and his brothers international band of Nigeria and Dr. Olololo real name as Dominic Ntiwunka. I really enjoyed the raucous vocals and the tight guitar playing on this song. Check out the guitar playing at the 3.40 mark and the percussion work at the 5.30 mark. Very uptempo and dance able. If anyone has any information on this band please let me know and I'll update the post. Happy Holidays from the highlife cave. Could you please post songs from this album? I have been looking for this album for a very long time now. This band is from Mbaise Imo state (hence the name mbaise brothers band). Thanks a lot. yes i really know his Dominic Ntiwunka. Dr.Sir.Olololo from Ogbe Mbaise we are the Town in Ahiazu Mbaise Local Gov please i have been looking for his music in youtobe i haven't see it please if you can to go Abia State and Owerri Imo State the music is there you buy and downlaod do have a blessed Don.Phinian Hope.